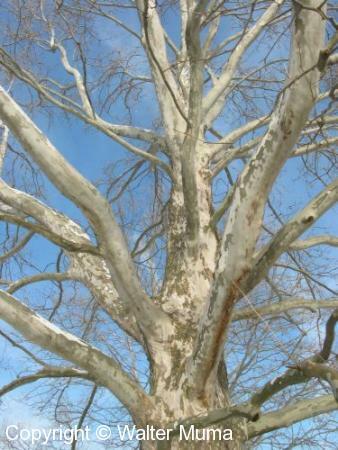 Distinctive features: Tree; Patchy bark. 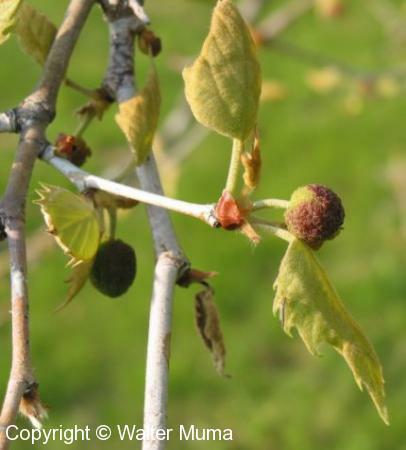  London Plane Tree (Platanus x acerifolia) - almost identical in appearance - the seed balls are different. Status: Common in southern areas. Photographs: 113 photographs available, of which 12 are featured on this page. SCROLL DOWN FOR PHOTOGRAPHS. 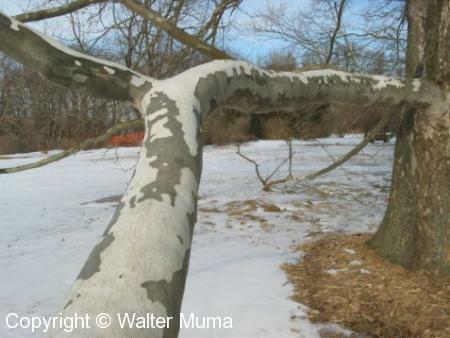 Sycamore bark is very distinctive. The multi-coloured patches are unique. A good view of the trunk and bark, looking up the tree. The bark on very old trees is quite different! However, the characteristic patchy bark will still be visible on younger branches farther up in the tree. 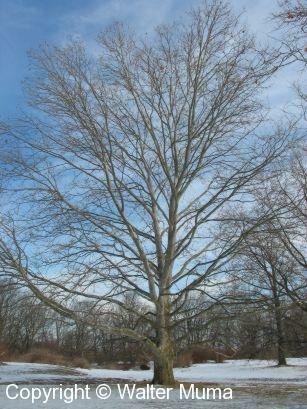 The overall shape and form of a mature tree. Here is a photo of a winter twig. Leaves starting to unfurl in May. Another picture of very young leaves, also showing an unopened flower "ball.". Typical Sycamore leaf. Sycamores are late leafers. In June their leaves are still growing out. 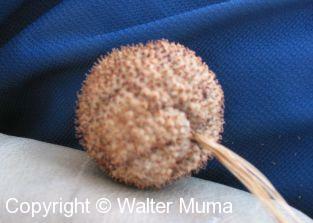 The fruit of Sycamore are these balls, about 1-2" in diameter. They often persist on the tree through the winter, eventually breaking apart into fine fibers which readily blow about in the wind. A very old and weathered Sycamore, in Point Pelee National park. A person can easily stand in the vertical slot.